C/ Illa Plana, 07800 Ibiza, Spanje. Located at only 200 m from the Talamancas beach, the hotel is located in front of the Ibizas harbor, with a splendid view of D´Alt Vila area. The Hotel guests are very welcome to join the boat-shuttle to Ibiza downtown by taking the 10 minutes trip on the Corso-boat (at charge). The Casino, good restaurants and famous night clubs are nearby and other major clubs are just a short drive. This is also a perfect base for exploring the beautiful countryside and beaches around the island.The Hotel has a great experience in organization of conventions, incentives, weddings, banquets and events. 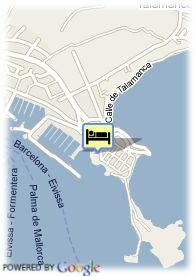 The famous clubs Pacha, Keeper, and Prestige are very close to the hotel. The hotel has 1 room adapted for handicap people.